If you need information about a detainee that is housed at this facility, you may call (318) 992-1600 between the hours of 8 a.m. and 5 p.m. When you call, please have the individual’s biographical information ready, including first, last and hyphenated names, any aliases he or she may use, date of birth and country of birth. Detainees cannot receive incoming calls. If you need to get in touch with a detainee to leave an urgent message, you must call (318) 992-7800 and leave the detainee’s full name, alien registration number and your name and telephone number where you can be reached. The detainee will be given your message. Parking: Visitor parking is in the front of the facility. Accessibility for Individuals with Disabilities: The facility does not discriminate based on disability and provides detainees with disability-related accommodations, as needed, to access its programs and activities. For information about a matter before the immigration court, you may call 1-800-898-7180 to speak with them directly. Applications for relief from removal and other applications requested by the immigration judge must be filed directly with the immigration court. For information about a matter before the Board of Immigration Appeals (BIA), you may call (703) 605-1007 where you can obtain automated information or speak with a live representative during office hours. Click the link for a list of pro bono representatives nationwide who might be able to assist you. Delivery bonds are posted when a person has been taken into ICE custody and placed into removal proceedings while in the United States. The person posting the bond must show proof of identity (valid Government-issued photo identification, passport, military ID, LPR card, driver’s license, etc.). This person (the obligor) is responsible for ensuring that the alien presents them self before an officer or representative of this agency whenever a request is made. Monday Male Detainees 9 a.m. to 11 a.m. and 6 p.m. to 8 p.m. Female Detainees 11 a.m. to 1 p.m. and 8 p.m. to 10 p.m.
Tuesday Male Detainees 9 a.m. to 11 a.m. and 6 p.m. to 8 p.m.
Wednesday Male Detainees 9 a.m. to 11 a.m. and 6 p.m. to 8 p.m.
Thursday Male Detainees 9 a.m. to 11 a.m. and 6 p.m. to 8 p.m.
Friday Male Detainees 9 a.m. to 11 a.m. and 6 p.m. to 8 p.m.
Saturday Male Detainees 12 p.m. to 4 p.m. and 6 p.m. to 8 p.m. Female Detainees 8 a.m. to 10 a.m. and 8 p.m. to 10 p.m.
Sunday Male Detainees 8 a.m. to 10 a.m. and 8 p.m. to 10 p.m. Female Detainees 12 p.m. to 4 p.m. and 6 p.m. to 8 p.m.
To ensure adequate time to process visitors through security, all visitors must arrive 45 minutes prior to the scheduled visit time. Visitors must present a valid verifiable government-issued identification card to enter the facility. Visits are limited to 60 minutes. Visits longer than 60 minutes may be permissible with prior approval of the warden. Minors who are visiting the facility must be accompanied by an adult guardian (18 years or older). Minors must not be left unaccompanied in the waiting room, visiting room or any other area. Legal representatives of detainees are authorized to visit their clients during the following hours: Seven days a week from 6 a.m. - 11 p.m., including holidays. A list of pro bono (free) legal organizations will be posted in all detainee housing units and other appropriate areas. This list shall be updated quarterly. If a detainee wishes to see a representative or paralegal from that organization, it is the detainee’s responsibility to contact them for an appointment. Consular officials may meet with their detained nationals at any time. It is requested that prior arrangements be made with the ICE Supervisory Deportation Officer to the extent possible, and that consular officials bring appropriate credentials when they come to the facility. 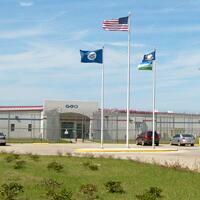 The ICE Supervisory Deportation Officer in charge of the facility can be reached at (318) 992-1600. Clergy may visit detainees at any time, but must make prior arrangements with the Religious Coordinator at (318) 992-7817. All family or other social visits are non-contact. No firearms or weapons of any kind are permitted in the facility. If visitors are or appear to be intoxicated, visitation will not be allowed. All visitors are subject to search while in the facility. Visitors are not allowed to pass or attempt to pass any items to detainees. Visitors are not allowed to carry any items into the visitation area. All individuals requesting admittance to the facility or the visitation area are subject to a pat-down search of their person, an inspection of their belongings, and a metal scan search. Individuals refusing to cooperate with a reasonable search will not be admitted. No firearms or weapons of any kind are permitted. No electronic devices (cell phones, pagers, radios, etc.) are permitted in the secure areas of this facility. Letters sent to detainees must include the last four digits of the detainee’s A-number (Alien Number), plus the sender’s name and address. To enhance the safety of the facility, all incoming mail is subject to screening for contraband. The mail is not read upon opening, only inspected by the delivering officer. Detainees may send mail from the facility. Detainees may seal their outgoing letters and place them in the provided receptacle. All incoming mail will be delivered to the detainee, and outgoing mail will be routed to the proper postal office within 24 hours of receipt by facility staff. A mail pick-up and delivery schedule is posted in all housing units. Detainees are allowed to purchase stamps for use. Generally, there is no limit to the amount of correspondence detainees may send at their own expense. Indigent detainees (those who have no means of financial support and no funds in their facility account) will be provided postage allowance at government expense. When detainees depart the facility or are transferred to another facility, only their legal mail will be forwarded to them. General correspondence will be endorsed "Return to Sender" and returned to the post office. If detainees receive funds in the mail, they will be taken to the processing area for the money to be placed into their account. The processing officer will provide a receipt for all funds received. Detainees are cautioned not to have cash sent to them in the mail. Note that detainees being removed from the United States are allowed one small piece of luggage. If a detainee does not have such baggage, such luggage can be sent/delivered after receiving approval from Supervisory Deportation Officer. Please be advised that for security reasons, no electronic devices (cell phones, electric razors, laptop computers, radios, etc.) will be accepted. The Facility has a responsibility to protect the privacy and other rights of detainees and members of the staff. Therefore, interviews will be regulated to ensure the orderly and safe operation of the Facility. Ordinarily, live television or radio interviews will not be permitted in the facility. Press should contact ICE Public Affairs Officer Brian Cox at (504) 310-8887 for further information. A news media representative who desires to conduct an interview with a detainee must apply in writing to the New Orleans Field Office, Office of Enforcement and Removal Operations, indicating familiarity with and agreement to comply with the rules and regulations of the facility as provided to that person by staff. A detainee has the right not to be interviewed, photographed, or recorded by the media. Before interviewing, photographing, or recording the voice of a detainee, a visiting representative of the media must obtain written permission from that individual. All FOIA and Privacy Act requests must be submitted on form G-639 (Freedom of Information / Privacy Act Request) or in letter format. All requests must contain the original, notarized signature of the subject in question. Please complete the form G-639 thoroughly and if writing a letter, be sure to include the full name, any other names used, date of birth, place of birth, A-number of the alien you are seeking information about, as well as your full name, address, and telephone number, so that we may contact you if we have any questions.